Compared to its neighboring countries — such as Poland, Belarus, and the Czech Republic, Ukraine offers more competitive outsourcing rates paired with a much larger tech talent pool. Agile Eastern Europe Conference, PyCon Ukraine, iForum, IT Arena, and DEV_Challenge are only a few of Ukraine’s major tech events giving the country’s IT professionals the opportunity to meet their peers and pick up on the best practices of the industry leaders. The largest conferences attract over 7,000 attendees and international speakers. On a more local level, smaller tech events take place all the time. 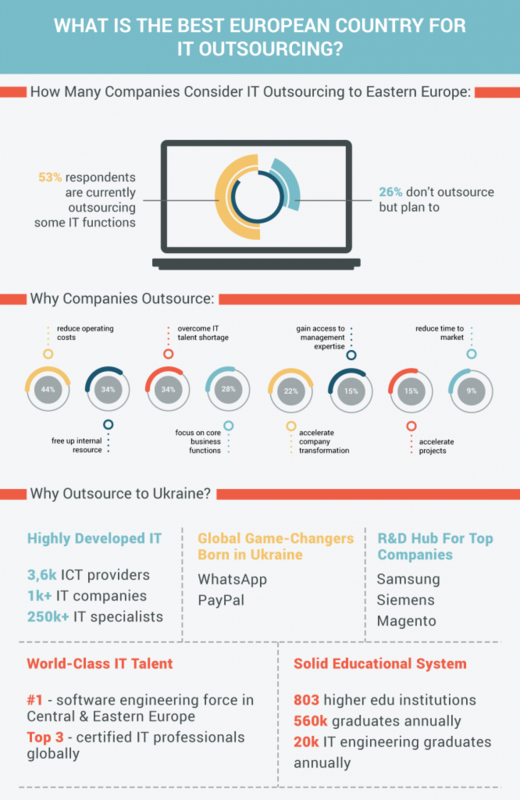 Ukraine is home to the largest number of IT professionals in Europe. The country also ranks fourth in the world by the number of tech workers. The country currently employs over 90,000 IT specialists, including 50,000 software developers. By 2020, Ukraine’s IT engineering workforce is expected to surpass the 200,000 mark. Ukraine’s 402 universities and colleges boast more science graduates per year than many other countries prized for innovation, like Japan, Sweden, Norway, Belgium, and the Netherlands. Eighty percent of Ukraine’s tech workers report having an intermediate or higher level of English proficiency.